The major order that Doka ‘landed’ for the Second Midtown Tunnel will actually be finished underwater! This 1,13 km long immersed tunnel will link the cities of Norfolk and Portsmouth in the US state of Virginia. The eleven separate segments of the tunnel are being cast at a dry dock in Baltimore, MD, after which they will be floated about 320 km south to the Elizabeth River and lowered to the riverbed. The ‘Heavy-duty supporting system SL-1’ tunnel formwork that Doka is supplying to this project is a high-performing yet cost-saving solution. As well as being the first SL-1 project in the USA, the Second Midtown Tunnel is the biggest SL-1 tunnel project (by order volume) in Doka’s history. Norfolk and Portsmouth have been linked beneath the Elizabeth River since the building of an underwater tunnel just over 50 years ago. Carrying around a million vehicles per month, this transportation artery is one of the busiest routes east of the Mississippi. Chronic congestion in and around the two-lane tunnel, and long journey times, are the order of the day. To relieve this situation, the old Midtown Tunnel is to be rehabilitated and a new two-lane immersed tunnel built alongside it. Together with the existing tunnel, the Second Midtown Tunnel will double traffic capacity on this route. Doka supplied the formwork solution for a similar project in 2005: the 3 km long Busan-Geoje Fixed Link is one of the deepest immersed tunnels in the world and connects South Korea’s second-largest city, Busan, to the island of Geoje at a depth of as much as 60 m. The 100-percent custom-built solution convinced the construction firm Daewoo and enriched the Doka tunnel experts’ long-standing experience with yet another prestige project. The 1,13 km long Second Midtown tunnel will consist of eleven separate segments, each measuring approx. 106 m long by 16 m wide by 8,8 m high. Each segment weighs nearly 13.000 tons and is being pre-cast in a dry dock in Baltimore, Maryland. The finished segments will then embark on an about 320 km southbound voyage, being floated down Chesapeake Bay on giant barges to the immersion site in Norfolk. Here, the tunnel segments will be fixed together underwater and sealed with rubber seals. This special system, and the use of watertight concrete, make the Second Midtown Tunnel only the second such tunnel in the whole US not to need an external steel skin. At the dry dock, the preassembly work on the Doka tunnel formwork traveller was completed at the beginning of 2013 and the first trial pours are now being carried out. From June onward, the tunnel segments will enter ‘series production’. From February 2013 until April 2014, preparations at the tunnel site under the Elizabeth River will be in full swing. The riverbed around the tunnel will be dredged into shape so that the segments can be lowered into place on schedule between November 2014 and November 2015. Once it is completed in September 2016, the Second Midtown Tunnel will get traffic flowing smoothly again across the bed of the Elizabeth River. By opting for the Heavy-duty supporting system SL-1 from Doka, the SKW Constructors Inc. consortium of Skanska, Kiewit and Weeks has chosen a flexible, high-performing formwork solution. Designed for high loads, the Heavy-duty supporting system SL-1 provides an exceedingly strong, torsion-proof subconstruction for the tunnel formwork. This modularly designed system ensures swift, economically efficient construction progress, regardless of the shape and load. The extra-stable formwork allows only the very smallest of deformations, and can easily be re-adjusted in any direction thanks to the fine pitch screw-threads. 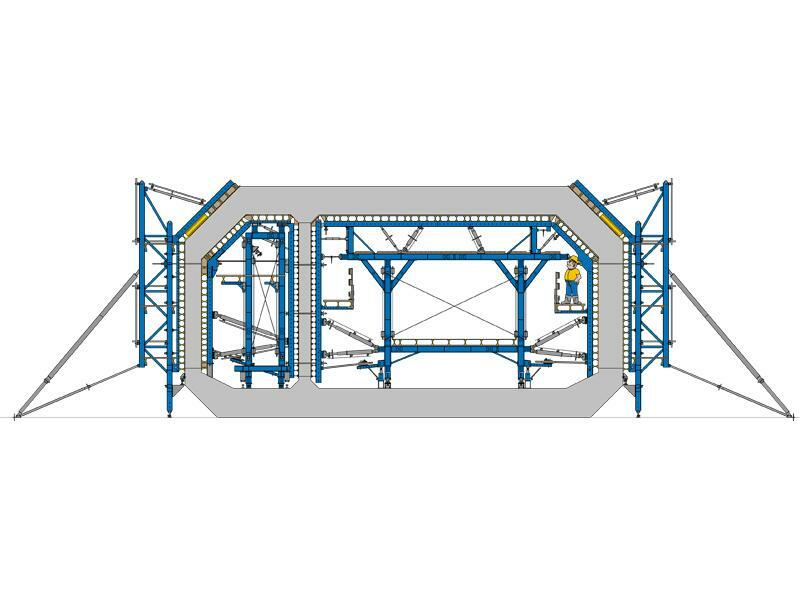 The fully rentable tunnel formwork traveller achieves short set-up times, due to pre-assembly of the formwork and the heavy-duty SL-1 components, and short repositioning times thanks to the all-hydraulic rail guidance. This immersed-tunnel project is a good example of just how individualised Doka solutions are: with the aid of winches and hand levers, the heavy equipment being used for the Second Midtown Tunnel can be repositioned by muscle power alone. The formwork traveller can be moved safely even on steep longitudinal and transverse gradients. The integrated working platforms and ladderways on this CE-labelled system provide extra safety during the forming operations. The Heavy-duty supporting system SL-1 has already performed convincingly under difficult geological conditions on Switzerland’s 57 km long Gotthard Base Tunnel, the longest railway tunnel in the world. Its short cycle times, and ease of formwork set-up and removal, were clinch factors for the client. This heavy-duty supporting system was also fielded on the large-scale upgrade and extension of the M4 metro line in the Hungarian capital Budapest. 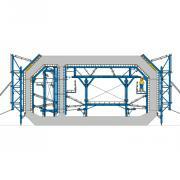 The Heavy-duty supporting system SL-1 is fully compatible with Large-area formwork Top 50. 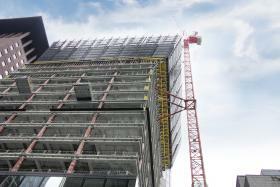 This flexible system accommodates any architectural requirement and saves craneage because of its large gang-forms. The element joints are designed to ensure a perfect joint pattern. On the Second Midtown Tunnel, the high-load components allow the use of a hydrostatic design basis for the centre wall of the tunnel segments. This makes rapid pouring possible, with no need to worry about the rate of placing. Right from the outset, the stringent requirements applying to the implementation of this project have called for precisely detailed preparations and strong teamwork from the international experts involved. To achieve the best possible exchange of expertise, a colleague from the local branch spent several weeks at Doka HQ during the planning phase, to work with the specialists from the Tunnel Competence Centre on identifying the right solution. In this way, it was possible to join with the client to elaborate a suitable solution, and then to give the client comprehensive in-situ service. Andreas Zitzenbacher from the Business Development Competence Centre explains some of the aims of this international project-management assignment: “The challenge facing us on the Midtown Tunnel is to achieve tight tolerances and ultra-high precision. For us in the team, that means that we have to communicate and work together very intensively”. Regular face-to-face meetings, as well as telephone and video conferences, are held to ensure that despite the great distances, the project is carried out in the best and most effective way, from the planning phase through until completion, and to make sure that the biggest SL-1 tunnel order in Doka’s history is a complete success. Thank you for your interest - Second Midtown Tunnel – an underwater solution to keep the traffic flowing. Thank you very much for your interest - Second Midtown Tunnel – an underwater solution to keep the traffic flowing.